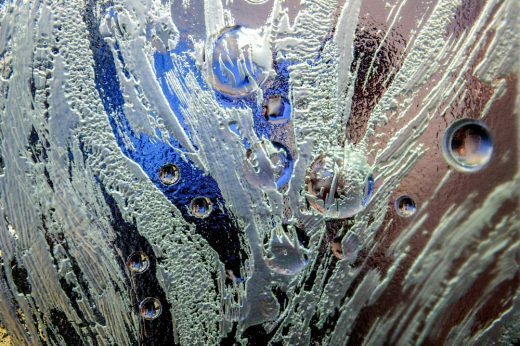 Last week saw the return of Surface Design Show to London’s Business Design Centre where over 5,000 visitors saw the best and most tactile in new surfaces. More than 170 exhibitors from 15 countries showcased the very best in exterior and interior surface materials and treatments. 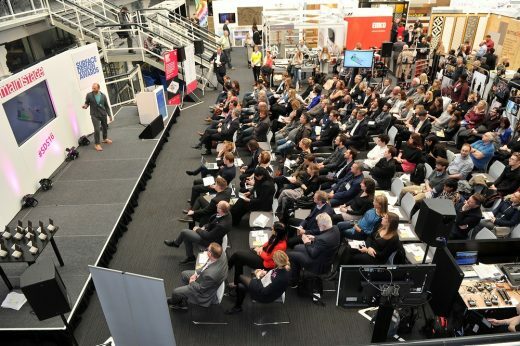 •	The Main Stage, designed by Anne Kyyro Quinn, created a stunning platform for the exciting programme of talks which included sets from interior designer and TV presenter Naomi Cleaver, colour and trend expert Sally Angharad and Houzz. •	The fantastic PechaKucha Evening was another highlight of the events programme, with a full house listening to an engaging set of panellists being hosted by architect Phil Coffey of Coffey Architects. •	Opening Night Live Debate, which tackled the hot topic of housing in London and attracted a large and varied audience. Led by Peter Murray Chairman of the NLA, the expert panel presented their views on house prices in London and discussed potential solutions. 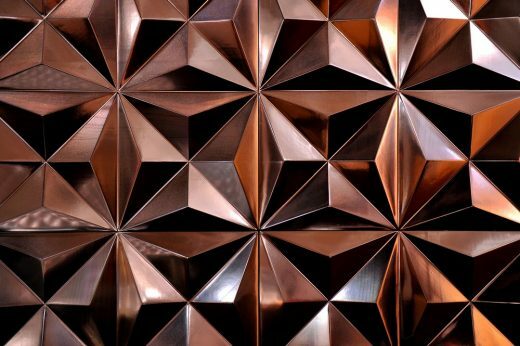 Surface Design Show 2019 will take place at London’s Business Design Centre from 5-7 February 2019. The winners of this year’s Surface Design Awards have been announced, unveiling some of the best projects from across the globe which feature innovative and exciting materials and surfaces. 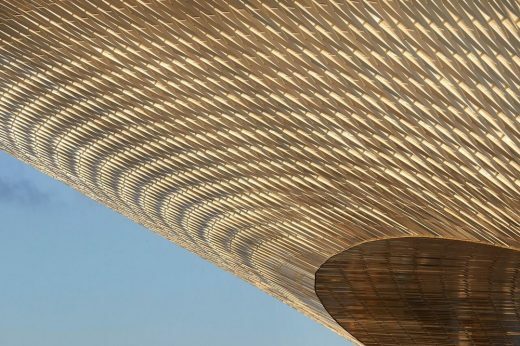 The Museum of Art, Architecture and Technology (MAAT) in Lisbon by AL_A was announced Supreme Winner as well as winner of the Public Building Exterior Surface. 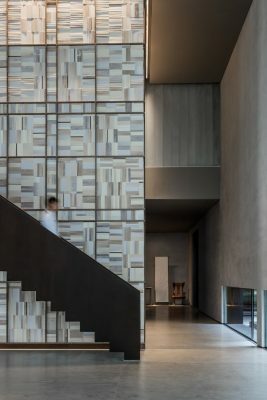 The design builds upon Portugal’s rich tradition of craft and ceramics, almost 15,000 three-dimensional crackle glazed tiles articulate the façade and produce a complex surface that gives mutable readings of water, light and shadow. The project was described by Jo Littlefair as “promoting art and architecture just by being there”. 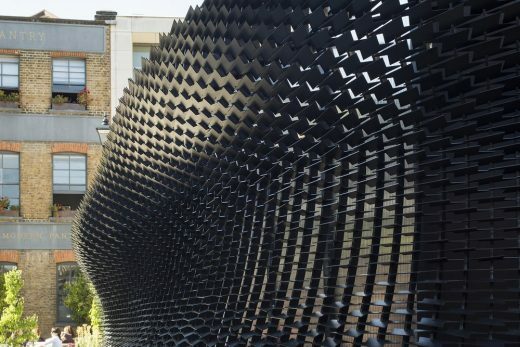 Making the win all the more impressive, AL_A were up against spectacular entries from Foster & Partners, Heatherwick Studio and The Manser Project. 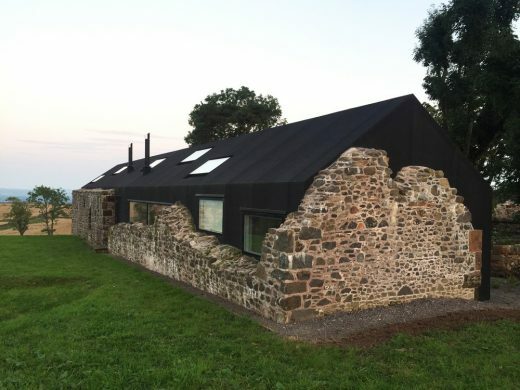 In several categories, the best in applied surface design was put forward by a number of brilliant architects and designers including Coffey Architects, Giles Miller Studio and Studio Octopi amongst others. 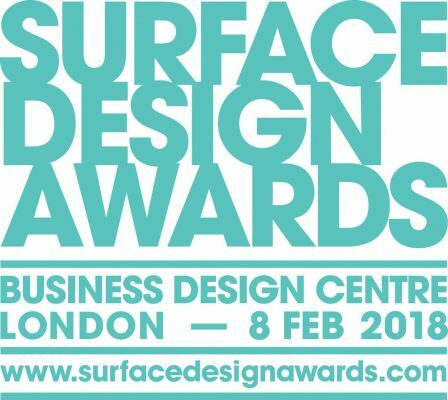 The Surface Design Awards took place on the 8 February as part of Surface Design Show 2018. 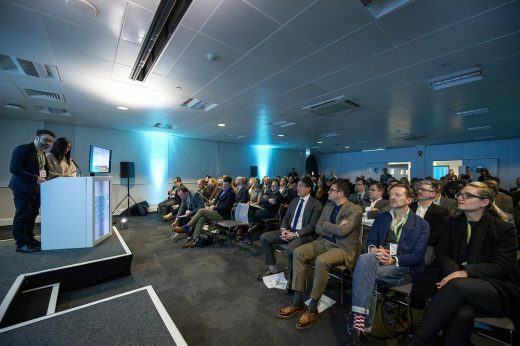 The Surface Design Show is the only event in the UK focusing solely on interior and exterior surface design, facilitating thousands of innovative and thrilling materials to connect with an audience of architects and designers. 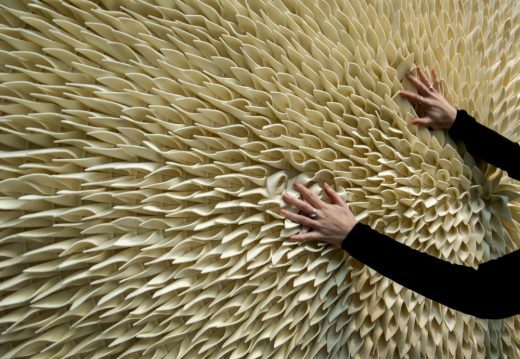 Launched in 2013, Surface Design Awards has grown exponentially in both stature and quality. International growth has been staggering this year with project entries from 16 different countries. 51% of the projects were outside the UK. 13 from China, 7 from Portugal and further entries from Spain, Italy, India, Egypt, Canada, America, Belgium, Lithuania, Taiwan and Hungary. There were 39 entries from the UK, 69% of these being from London. The most popular categories entered were Commercial Interiors and Housing Interiors. The judging panel of the eleven Award categories was co-chaired by Tina Norden, of Conran and Partners, and Ab Rogers of Ab Rogers Design. The judges included Jenny Jones of Studio Jenny Jones, Sacha Leong of Studioilse, Constantina Tsoutsikou of HBA London, Jo Littlefair of Goddard Littlefair, Howard Sullivan of YourStudio and Nir Gilad of Nous Design, all of whom are experts in their fields. Vanke Day Park Sales Office & Culture Exhibition Centre by Zhao Yu located in the heart of Shenzhen Bay, China is the Commercial Interior Surface winner. The project was praised by co-chair of the judging panel Ab Rogers for having “a nice use of materials with the alignment of the walls being exquisite”. The most arresting part of the design is the installation of library and floral work in the central display hall. The big bookcase was made of overlaying paper sheets framed by steel strips. Also eye-catching were the teahouses created in distinctive styles embodying diverse tea culture under the background of characteristic cultures in Beijing, Shanghai, and Shenzhen. Returning winners Maria Ana Vasco Costa were omnipresent at this year’s Awards, picking up Awards for Commercial Exterior Surface for Friendly Border Apartment, as well as the Housing Exterior Surface Award for Presidente Arriaga Building, both projects, located in Lisbon. Friendly Border Apartments was Inspired by the famous “Casa dos Bicos”, a historical building from the 16th century located in old Lisbon and so designed a diamond shaped tile alternated with a simple flat square. The project was praised by judge Howard Sullivan as “Quirky and original exterior treatment which sets apart the building on the street”. The façade of the Presidente Arriaga Building resulted from a variation of 1 three-dimensional and 3 two-dimensional tiles which created different patterns from the street view and depending on the time of day, bestowing an organic character to a classic rectangular design. The design made “A real connection to the history of where it stands” according to judge Nir Gilad. The years’ Awards played host to a joint winner for Housing Exterior Surface, Presidente Arriaga Building by Maria Ana Vasco Costa for STC Arquitectos and John Ruskin Street by David Stanley and Romy Grabosch. The transformation strategy adopted for John Ruskin Street was to extend out to create a flexible family room; and to dig down to create an independent sunken office and fully functional annexe, with the garden being the focus. Both David Stanley and Romy Gabosch are award winning architects which enabled them to work together to transform the flat into their dream home. Ensuring that sustainability and environmental conservation was an essential element of the design and enabled both architects to choose the materials that best fit their desired outcome. 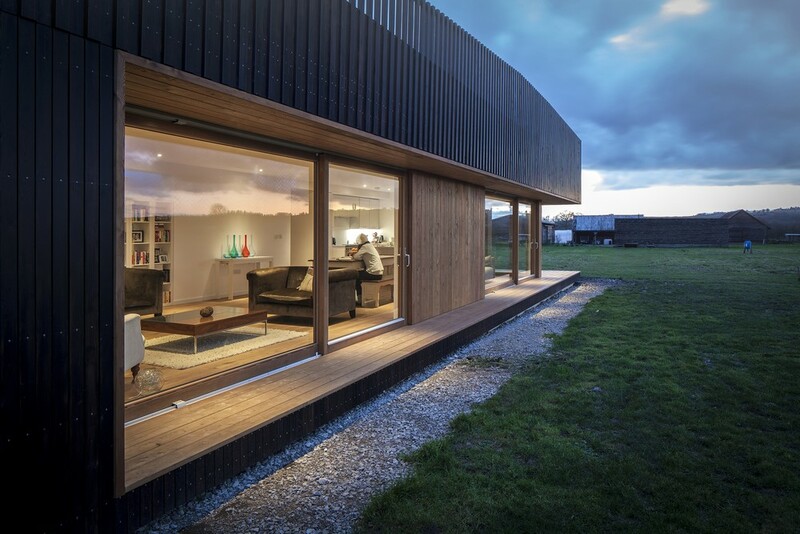 The Light and Surface Interior Award winner Zumi for Soundscapes in Gistel, Belgium was recognised for “the integration of light texture and acoustic performance in one product and the proportion and materiality was successful”, as said by judge Jenny Jones. The project combined energy-efficient LED lighting with a high- quality acoustic panel and the option to integrate speakers. The Eastbourne Pavilion is the result of a design build competition in which the local council asked designers to create iconic beach huts by the Seafront Walk. The winner of the Light and Surface Exterior category was the Beach Hut Monument for Beachy Head Lady by Stephen Foley. The monument is made of translucent Corian Panels with an engraving on the street side of the hut explaining the story behind the design. The result was described by Ab Rogers as “Joyful multifaceted illuminated hut, (with a strong dialogue). The Housing Interior Surface award went to architects, Studio Octopi for House 13, which involved the full excavation of a basement below a Victorian house in Wandsworth, South London. The project followed the theme of exploring innovative ways to link a basement with the existing house and garden. The resulting plan arrangement is fluid whilst also dramatically improving the natural lighting for the key spaces. The project was awarded by the judges for its “incredible detail”, as highlighted by Jo Littlefair, as well as being “slick and well executed” said Tina Norden. 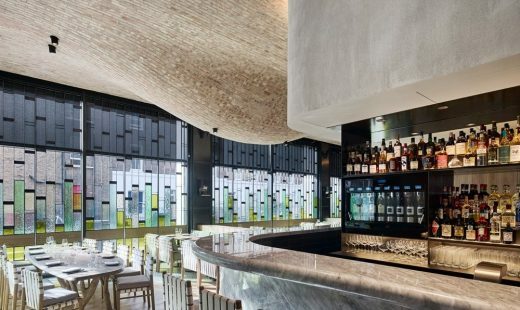 The Cannavacciuolo Bistrot Torino in Rome, Retail Interior Surface winner, was designed with attention to the customer welfare and particularly to the acoustic comfort, meaning good speech perception and absence of disturbance. Acoustics and audio system designed by Davide Squarciapino of Delta Techno Studio S.r.l created a healthy environment, taking care of air pureness and optimum energy balance for human wellbeing. Giles Miller Studio returns to Surface Design Awards after winning consecutively with the Retail Interior Surface in 2015, Commercial Interior Surface in 2016 and Sustainable Exterior Surface in 2017. 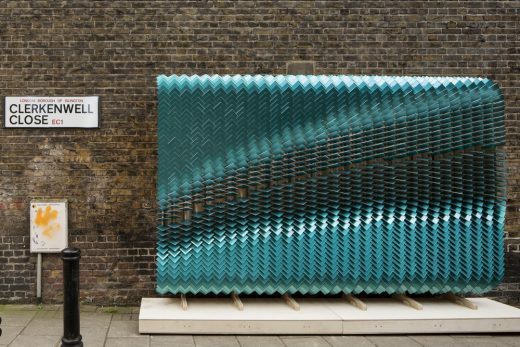 The Bolt, winner of the 2018 Temporary Surface Award, was installed for the duration of Clerkenwell Design Week 2017 in a temporary showroom for lifestyle brand Shinola in the heart of St. Johns Square in London. 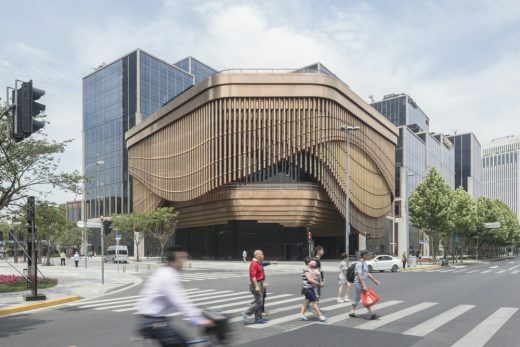 The building showcased the latest louvre-generated facade concepts from thier studio, demonstrating how a surface can control visual and light permeability to generate intrigue surrounding the buildings contents. A perforated screen designed for the Science Museum in London by Coffey Architects is the winner of the Public Building Interior Surface category. 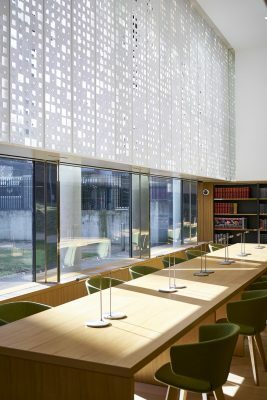 The clever design of the double layered screen produces dappled light as the sun moves across the sky, engaging the visitor with the passing of time and negating library fatigue. Judge Nir Gilad commented “I looked at the picture and it made me want to visit the Science Museum”. There is only 1 week until the Surface Design Awards entry closes and we are still looking for the best interior and exterior design projects which feature innovative surfaces. 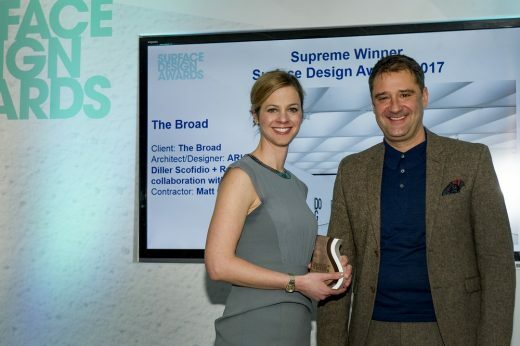 Now in its sixth year the Surface Design Awards recognise progressive design and the use of innovative surfaces in projects both in the UK and internationally. The Surface Design Awards are part of Surface Design show the only event in the UK that solely focuses on interior and exterior design, allowing for thousands of innovative and thrilling materials to connect with an audience of architects and designers. Surface Design Show returns to the Business Design Centre, Islington London from the 6-8 February 2018. Launched in 2013, Surface Design Awards has grown exponentially in both stature and quality. The 2018 Awards will not be short of variety with 94 projects located in 10 different countries entering in 2017. There are 13 Awards across 7 different categories with most categories being divided into exterior and interior. Each project is judged on a variety of criteria including materials used, type of surface and aesthetic design. The 2018 judging panel will be co-chaired by Ab Rogers of Ab Rogers Design and Tina Norden from Conran and Partners. 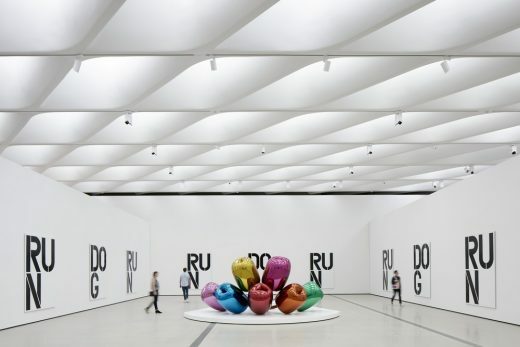 In 2017 there were 34 finalists with ARUP/ Diller Scofidio + Renfro in collaboration with Gensler receiving the honour of becoming Surface Design Awards Supreme Winner 2017 for their stunning project The Broad Museum in Los Angeles. “It’s clear that this is an incredibly special, visually stimulating building and it’s great for it to have been recognised with this award. The airy, honeycomb-like ‘veil’ that envelopes the structure effectively filters natural daylight across the space, which was a unique and exciting challenge for us to work with. I really believe that this project wouldn’t have been possible without the close collaboration between the client, the architect and the design team”. Register now to secure your involvement in one of the most respected events of the year and to be in with a chance to win an Award. February 17, 2018 in Awards.